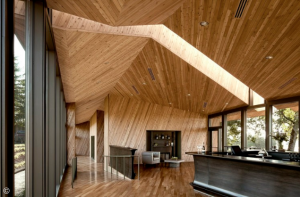 With the help of ThinkWood, ArchDaily has gathered together its choice of the 100 best wood architecture projects in the US. Considered one of the noblest building materials – and also a favorite of many global architects – wood delivers aesthetic, structural, and practical value in the most versatile of ways. Through different techniques, such as crafted or prefabricated wood, wooden construction remains relevant not only in the history but also in the forefront of architecture and design (thanks to new technologies that have expanded its possibilities). From temporary pavilions to single-family homes and multi-story, large-scale institutions, wood has shown its value at the same level as many other structural materials such as steel, brick, or even concrete. This is especially prominent in the United States, where renowned architects are using new techniques to advance the solutions that this material can provide. Also, new regulations are allowing architects to further explore the diversity and possibilities of building with wood.